Lee McCulloch will sign for Kilmarnock in a player-coach role, his representative has confirmed. The former Rangers captain will join Killie on a three-year deal to team up with boss Gary Locke at Rugby Park. McCulloch, 37, was deemed surplus to requirements at Ibrox after Rangers' new management team of Mark Warburton and David Weir arrived in June. The former Wigan Athletic midfielder won three top-flight league titles and two Scottish Cups with Rangers. McCulloch, who played many of his 46 games for Rangers last season in central defence, joins striker Kris Boyd and full-back Stevie Smith in making the move to Kilmarnock from Ibrox this summer. 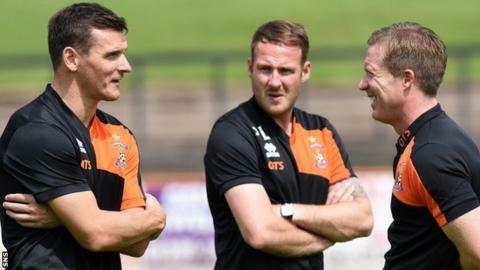 Scotland international McCulloch was involved with Locke in Kilmarnock's preparations for Saturday's friendly against Berwick Rangers. He joined Wigan from Motherwell in March 2001 and, after more than six years there, moved to Rangers for £2.25m.